The founding members were DePauw students Gilbert C. Clippinger, Charles A. Fisher, William M. Glenn, Marion H. Hedges, L. Aldis Hutchens, Edward H. Lockwood, LeRoy H. Millikan, Eugene B. Pulliam, Paul M. Riddick, and Lawrence H. Sloan. Within a few years, Sigma Delta Chi had spread to a dozen other campuses and eventually became a national institution and an influential voice in American journalism. The organization officially changed it's name to the Society of Professional Journalists in 1988. Today it is the nation's most broad-based journalism organization, encouraging the free practice of journalism and stimulating high standards of ethical behavior. SPJ promotes the free flow of information vital to a well-informed citizenry; works to inspire and educate the next generation of journalists; and protects First Amendment guarantees of freedom of speech and press. 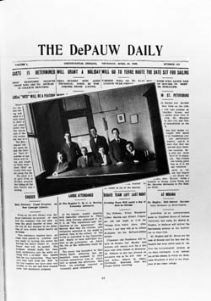 Read more about the founding of the organization in DePauw: A Pictorial History, accessible online by clicking here.